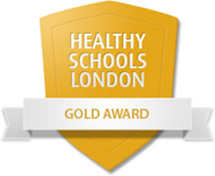 We are very proud to announce that we have now achieved the Gold Award for Healthy Schools London. This is in recognition of the work which we do to promote health and well being. The areas included in the scheme are: healthy eating, physical activity, emotional health and well-being, and personal, social health education. Healthy Schools London were very impressed with our hard work to improve our school lunch experience and our healthy packed lunch choices.